The Schooner Madagasca arrived at Lubec last week with a cargo of coal. The crew of the schooner in a casual way mentioned a strange animal seen off the coast of Cutler, Me. When questioned they related in a straightforward manner the incident. Two of the crew who saw the animal vouchsafe the truth of the following: During the morning watch, at about 6 0'clock, July 28th, while standing along under easy sail, making about four miles an hour, an object was seen on the starboard bow, which at first was thought by the man on lookout to be a large log. As the vessel drew nearer, the sailor, Edward Ray, formerly of Ellsworth, called the mate's attention to the object, saying he thought he saw the thing move. The mate, Len Armstrong, formerly a resident of and well known in Lubec, glanced in the direction pointed out and saw what he supposed to be a log floating upon the surface. As the course they were steering would bring them close alongside the floating mass the men gave little heed to it, but when within a few fathoms and near enough for a biscuit to have been tossed upon it, great was the astonishment of the two sailors to see the supposed log raise a snake-like head, give them one glance from a pair of glassy-eyes and glide with a sinuous, serpent-like movement away from the vessel. So close had they approached the reptiIe that every detail could be minutely noted. 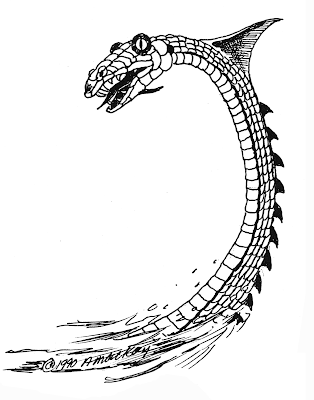 In shape the creature resembled a monstrous snake and was at least 30 feet long. Its body, covered with scales, was of a brownish green hue, and glistened in the rays of the sun. Extending along its back, from head to tail, was a spinal protuberance, consisting of innumerable points, seemingly formed of an extension of the back bone. Near the head and growing above the spine, was a thick, dark fin about the size of a man's hand. As nearly as could be estimated the creature's body was two feet in diameter, tapering slightly at the head and very noticeably at the tail. Apparently the body was of a uniformly greenish brown color both above and below. The two men had ample time to examine all these details, as, after moving off a short distance, the serpent lay quiet upon the water for some minutes, only lifting its head to gaze at the schooner. For half an hour or more the men watched the strange monster, which occasionally made a quick movement through the water, but going only a short distance each time. It appeared to be quite fearless, evincing little alarm at the sight of the vessel, and remained upon the surface of the water.